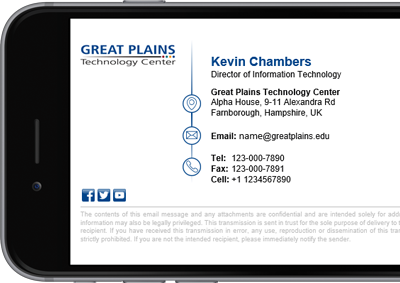 Great Plains Technology Center is a career and technology education center based in Oklahoma, USA and is part of the Oklahoma Department of Career and Technology Education system. The center helps to prepare individuals for success in both work and life and it trains over 1,000 students in more than 70 career majors. Using Exclaimer Cloud - Signatures for Office 365 makes one less thing to worry about, I know everything is being taken care of. Trying to maintain a consistent email signature across multiple users’ emails isn’t always simple. There are several ways to go about doing this; allow users to create their own email signature, have IT manually update every users’ email signature, or use a dedicated email signature solution. Great Plains Technology Center decided the last option was the best one to use. “We just moved to Office 365 and needed a cloud-based solution that could handle the different problems we were having with email signature standardization,” said Mr Chambers. After some searching, Mr Chambers came across Exclaimer and its Office 365 email signature solution, Exclaimer Cloud - Signatures for Office 365.